G3’s FINDr series is returning for the 2018-2019 unchanged, and it is part of a G3’s remarkably consistent naming scheme — their lineup includes skis under the categories of FINDr, ROAMr, SENDr, and SEEKr. The FINDr series is G3’s ski mountaineering line, and the FINDr 102 is the widest ski in that line (there is also the FINDr 84 and 96 — more info on those below). At 102 mm underfoot, G3 says the FINDr 102 bridges the gap between “fat, floaty powder skis and super light mountaineering skis.” We like to call out bad marketing copy around here, but G3 has done a good job here — that’s a nice, concise phrase that gives a pretty good idea of what this ski is supposed to do. The FINDr 102 has minimal tip rocker: a relatively shallow tip rocker line is paired with a modest amount of tip splay. The same thing can be said of the 102’s tail rocker. End result is that there is a good bit of effective edge here, so this isn’t going to be a super loose, surfy ski like the G3 Synapse 109. The FINDr 102 certainly qualifies as a lightweight ski, so it’s good to see that G3 left some surface area and mass up front. Yep, pretty even front to back. I expect this flex pattern + shape to make for a ski that feels supportive on snow, and that offers a big sweet spot to stand on. My primary question about the FINDr 102 is what the suspension of this ski will feel like. This isn’t the profile of a deep-pow touring ski (again, if that’s what you’re after, see the G3 Synapse 109). Instead, the FINDr 102 has the shape and rocker profile of a ski you’d take out in decent conditions or mixed conditions. 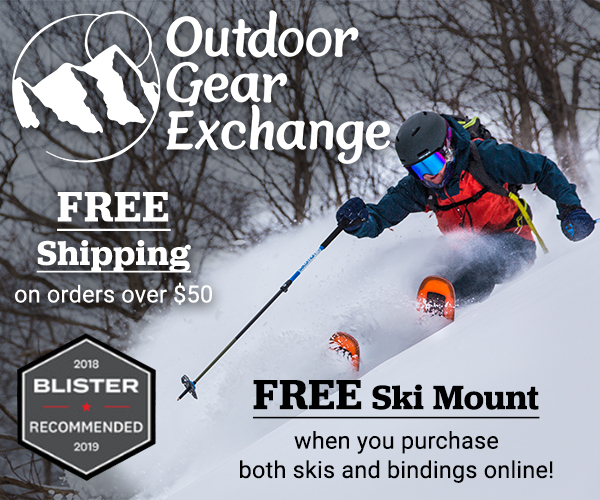 I don’t expect this ski to shine in deep snow (too little rocker), but I would expect it to perform well in firm and fairly difficult conditions — with the huge x-factor being the question of its suspension: given how stiff it is, will this lightweight ski feel jarring in refrozen coral? I’m on record as saying that the G3 Zenoxide Carbon Fusion 105 is my favorite ‘bad conditions’ touring ski. It’s like a touring version of the 13/14 Volkl Mantra. And it is much heavier than the new FINDr 102, so I’d basically bet my life that the Zenoxide 105’s bad-snow performance will be better. But the question is, How much better? Because if the FINDr 102 is still decent / adequate in tricky conditions, it sure saves a hell of a lot of weight over the Zenoxide 105 on the ascent. With the same G3 ION 12 demo binding the FINDr weighs ~2120 grams per ski (~1480 g without bindings) vs. the Zenoxide 105’s ~2538 grams per ski (~1876 & 1890 g without binding). For the mathematically challenged, that’s a substantial difference of more than 400 grams per ski. But the fact is that the FINDr 102 is definitely in the right ballpark weight-wise for a mountaineering ski of this width, and it makes sense for long days with high mileage. And this is even more true today than it was when this ski was first announced for the 16/17 season. Back then, this ski looked crazy light. But today, more and more skis are coming out that are approaching this weight, which by comparison, make the FINDr 102 look less crazy, just “light”. The FINDr doesn’t go quite as thin as the V-Werks BMT 109—it has a couple of additional millimeters of material that I am very, very intrigued by. 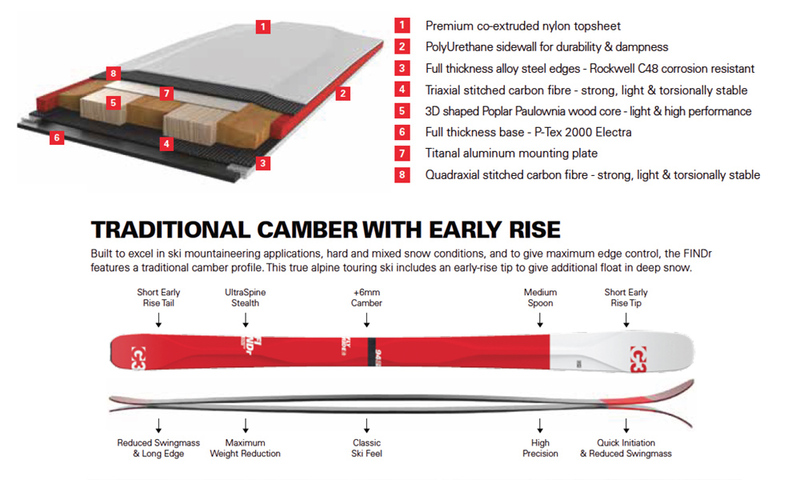 That extra material is a full-wrap, polyurethane (PU) sidewall, which is intended to increase dampness (always an issue for carbon skis) and enhance durability (which is basically the only concern we’ve had with the very good BMT series). So getting back to the suspension question, we’ll see how effectively those PU sidewalls help dampen this lightweight and relatively stiff ski. Let’s hear it: What did you think of these? Thinking about these vs. Helio 105s…. Spent a half day demoing the Helio 116 and I own a pair of the FINDr 86’s…yes opposite ends but gimme a second. Based on this review it seems like the philosophy of shape/ mount/ weight carries all the way through the FINDr line. Based on Blister’s review of the 106, I feel like it does a much better job executing that philosophy in the thinner side of the line (Love my 86’s). Yes, I’m wondering as well. the backcountryskiingcanada website likes the G3’s much better than the Helios 105s. But then I heard some really good things about the BDs. Demoed both the 175 Helio 105 and 172 FINDr 102 back to back this past weekend. Despite similar dimensions and weight, they skied very differently. The Helio felt more like a slarvy powder ski than I would have guessed, drifting around on the wet crud I was mostly on. They did ok on the icy sections once the edge engaged, but it did take a minute to get there. It skied like a powder ski, in other words. The FINDr only really got good for me when the snow was smooth and you could carve medium radius turns. On the slightly deeper, more roughed up snow at the start of the run, they didn’t feel either locked into turns or slarvy. Kind of neither. A big vague. They didn’t get tossed too badly, but just didn’t feel locked in either. Hard to explain. Once the pitch backed off and the snow was smoother, they felt really nice. Damp for a carbon ski. Only a couple runs on each at a demo, so no deep snow or touring, so YMMV. I’m 5’11”, 175lbs, aggressive skier….would you recommend a 184 or 189 in the G3 FINDR 102? I ski in western Montana, all conditions, 2000-6000′ average climbing/day…mix of trees and open glades, chutes, and bowl skiing. Any plans to test either the Seekr 100 or 110? Also curious of any plans to test the seekr.